Restaurant menus are similar to fashion — some menu items come and go, while others have staying power (like blue jeans or a little black dress). 2018 menu trends feature a host of exotic ingredients coupled with old fashion preparation methods. While many of the 2018 menu trends are an extension of consumers growing awareness around health and environmental sustainability, others focus on adventure-seeking diners who want to experience global flavors when they go out to eat. Some of the trends noted have been gaining in popularity over the past few years, including street-food inspired cuisine, Mediterranean flavors and breakfast foods. Others are new in 2018, including Hawaiian Poke and the term ‘plant-based.’ Restaurant owners looking to freshen up their image can incorporate many of the most popular trends to their menu to add value. The newest buzzword in nutrition is Plant Based. This allows for more latitude than a traditional vegetarian or vegan diet, with small amounts of meat, dairy and other animal products. Plant Based is popular because of the obvious health benefits of eating more fruits and vegetables and also because of the smaller environmental footprint it leaves, versus eating beef or even poultry. For example, the estimated vegetarian diet footprint is half that of a diet that includes beef on a regular basis. Along with plant-based menu items, other hot vegetable trends popular on restaurant menus in 2018 include veggie based comfort foods like mashed cauliflower, squash blossom risotto and pizza featuring a zucchini crust. Expect to see things like kale, seaweed, turnip greens and zoodles (zucchini noodles) as regular menu features, no longer reserved for the vegetarian option. This is hardly a new trend — street food has been increasing in popularity for the past several years, along with the rise of the Food Truck. In 2018 street food is predicted to go mainstream and upscale. According to BizBash, street food is increasingly popular for catered events at hotels and conference centers- offering stylish menu ideas that go beyond burgers and fries or soups and sandwiches. Look for globally influenced street food such as Belgium waffles topped with decadent strawberries, cream and chocolate, Mexican Elote (roasted corn on the cob coated with mayo) or lahmacun — a Turkish flatbread pizza. 2014, 2015 and 2016 saw the mash-up of chemistry and cooking. Bartenders became mixologists and molecular gastronomy started popping up on menus all over the country. The novelty of transparent raviolis or smoked beer has waned and 2018 will bring about a return to old-fashioned cooking methods like fermenting, curing, slow cooking a roasting. 2018 also brings a renewed interest in heirloom fruits and vegetables and artisan butchery, according to Forbes. Chefs are thinking beyond chicken and beef to include more exotic menu options like ostrich, venison, bison and elk. They are also focusing on the idea of butcher to table — building on the desire of consumers to know where their food comes from and an urge to buy local. House-made items, whether it’s on-site fermented kombucha and ginger beer or homemade bread, continue to add value to restaurant menus. Rated number five on the 2017 What’s Hot Culinary Forecast by the National Restaurant Association, sustainable seafood has been a hot topic for several years. Farm raised seafood is touted as an environmentally friendly way to combat overfishing. For 2018, look for Atlantic croaker, bluefish and blackfish (tauog) along with the classic tuna, salmon and haddock. Another popular seafood option for 2017 is Hawaiian Poke (pronounced Po-Kay), which was the fasted moving hot trend on the 2018 Culinary Forecast. This dish of raw seafood (usually tuna or octopus) is served alongside rice and topped with a soy sauce. In an industry known for huge amounts of food waste, savvy chefs are looking for ways to use up the entire animal or vegetable. Along with nose-to-tail cooking, root-to-leaf is also an emerging trend for 2018. Be on the lookout for root purees, salads and pesto featuring vegetable greens. Chefs are also looking for ways to multipurpose ingredients. According to the article, 2017 Culinary & Cocktail Trends by Forbes, unusual food pairings like quinoa crusted chips made from chicken skins will be more commonplace in the New Year. This follows the general larger trend of being more ecologically mindful as well as a consumer trend of more being more willing to try new foods and flavors. Way back in 2013 I noted Mediterranean flavors as an new trend on the Culinary Forecast. In the four years since, flavors like pomegranate, zatar, sumac and cardamom, turmeric have continued to gain traction across multiple restaurant concepts. Middle Eastern and Israeli ingredients like hummus, lamb, and kefir (yogurt) feature prominently on menus, offering a unique departure from more common Mexican, Asian, or Italian cuisine. McDonalds isn’t the only restaurant concept to offer all day breakfast. 2018 breakfast food trends are a mash-up of morning classics (think IHOP) meets food truck street foods. Look for ethnic additions like chorizo and chimichurri or potato masala and Punjabi samaos to add flavor and flare to breakfast menus, making them ideal for lunch and dinner too. Despite being everywhere in 2015 and 2016, food bowls are not lessening in popularity. Brought mainstream by chains like Chipotle, bowls feature a myriad of ingredients — often deconstructed burrito or Korean bibimbap. Buddha bowls featuring fresh vegetables, rice and seasonings are also growing in popularity, as consumers focus on healthier food options when they dine out. Bowls can be for breakfast, lunch or dinner. They can be sweet or savory — or both. 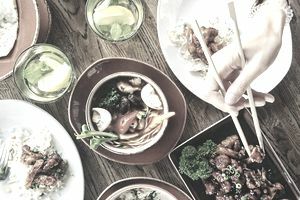 WellandGood.com notes that bowls popularity on restaurant menus is in part because of consumer trends toward healthy dining options. Bowls traditionally feature lots of fresh fruits and vegetables, whole grains and lean protein. A hallmark of the millennial diner is a desire to know as much as possible about where their food comes from. How is it raised? Is it grass fed? Cage free? Is it organic? Does it contain antibiotics or GMOs? Is grown or raised ethically, and are the workers on the farms treated ethically? Are sustainable farming practices used? The more restaurants can tell customers about the menu ingredients, the better. Noting where ingredients come from and how they are farmed and processed is a good way to build trust with consumers and add value to your brand. A classic American food, pizza consumption in 2016 was the highest it’s been in four years, in the United States. Expect an uptick in both fast food and fast causal pizza options. Even with a growing emphasis on health and sustainability, convenience and taste are still two important facets to the consumer dining experience. Pizza offers both of those things at an affordable price. While fast food pizza chains like Pizza hut and Dominos will continue to see steady sales, independent restaurants can incorporate many restaurant trends into a pizza dish, such as a pizza appetizer featuring local artisan cheese and meats, a vegan friendly plant based pizza entrée or an upscale seafood pizza tart for catered events. 2018 is shaping up to be one of the most innovative years when it comes to menu trends. Chefs are embracing traditional cooking methods such as roasting and braising with unusually ingredients such as ostrich and bison. A renewed national focus on quality over quantity is driving vegetable-centric dinner specials which, a few years ago, would have been reserved for the vegetarian option only. Food trucks continue in popularity and their street food has migrated into formal restaurant dining rooms. Ethnic fusion of flavors from all over the world will no doubt continue to influence dining choices in the years to come.